Much like the conversations about extra-terrestrials, vampires and werewolves, this conversation is absent of the usual hauntings, ghosts, and evil spirits. This conversation is full of the mystical creatures that have filled the pages of fairy tales for centuries. 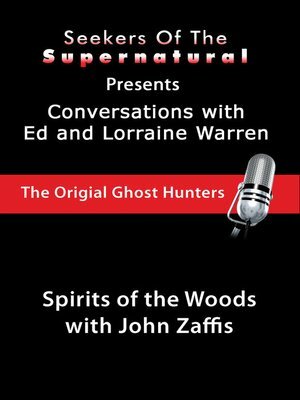 Ed and Lorraine Warren, along with Tony Spera and special guest, John Zaffis, discuss their encounters with fairies, gnomes, sprites, and all the different types of "woodland spirits." The setting for these creatures most often takes place within the British Isles, particularly Scotland, a place the Warrens have visited many times in order to learn more about these creatures shrouded in mystery. One very exciting fact regarding the subject of woodland spirits is the lack of skepticism Lorraine and Ed face. The people of Ireland and Scotland believe very openly in these woodland spirits and are very receptive to talk of fairies and gnomes. One of the most famous places to visit in this land of fairies is the Isles of Skye in Scotland near Dunvegan Castle. A mystical bridge located right outside the walls of the castle is appropriately named The Fairy Bridge and has drawn the Warrens to it's stories and magical atmosphere many times. This bridge is said to be the very spot where the owner of the castle, Lord MacLeod, ended his five-year marriage to one of these magical creatures. The woodland spirit gave him a flag that, once waived, would bring him help in times of trouble. The flag is still there today, safely kept inside the castle. Lorraine, being clairvoyant, can sense the fairies and mystical creatures surrounding this very sight and has even heard enchanting music playing in the distance on one special occasion. Ed Warren, who is not clairvoyant and normally does not see the things Lorraine is able to see, has no problem at all catching a glimpse of these woodland spirits. As a young boy he spent some time with gnomes, even went into their home and saw how they lived. His connection to these more natural spirits is strong and helped to build his interest in the mystical and paranormal. In fact, the Warren's are experienced with all types of the supernatural and are not afraid to open themselves up these magical spirits.